The CHALLENGER 3 provides the features and reliability you expect from industry’s leading manufacturer of electronic crane scales. 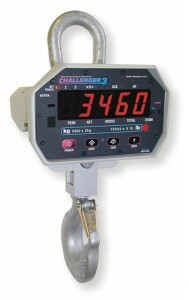 There is not a better value than the CHALLENGER 3 for indoor weighing applications up to 7.5 tons. Its advanced electronics offer you versatility with an unrivaled standard feature set that includes: Tare, Units switching, Totalizing, Peak, Hold, Set Points, Filtering and a convenient lift-cycle counter. The MSI-3460 incorporates the highly integrated MSI Scale Core weight-processing unit. The Scale Core combines a bit A/D Converter coupled with a highly efficient Micro controller providing Challenger 3 with all the industry leading weight functions of previous Challengers. In addition, the Scale Core features flash memory for easy software updates and the ability to save and restore calibration and operational settings. The Challenger 3 display board boasts large 1.5 inch (38 mm) LED digits with increased operating time. The Challenger 3 also offers optional RF Remote Control. This high resolution crane scale can be set upto 10,000 divisions giving a precise 0.1%loading accuracy over a broad capacity range from 125 to 7,000 kg. With over 80 hours of product operating time is reached with a single 6-volt rechargeable battery. This has been upgraded to NEMA 4, IP65 levels which is unrivaled in this type of industry with the highest safety standards, MSI’s Challenger continues to sustain minimum 200% safe and 500% ultimate load ratings.